An interrogation of the first feature film with synchronized dialogue, premiering this September at Abrons Arts Center. Tracey Conyer Lee and Joshua William Gelb in (((jazz singer))) at Prelude 2018. Photo by Maria Baranova. Nehemiah Luckett in (((jazz singer))) at Prelude 2018. Photo by Maria Baranova. Tracey Conyer Lee and Nehemiah Luckett in (((jazz singer))) at Prelude 2018. Photo by Maria Baranova. An interrogation of the first feature film with synchronized dialogue, The Jazz Singer. Most famously released as the first feature-length film with spoken dialogue, The Jazz Singer is a distinctly American story about the cost of assimilation, following a “jazz crooner” as he’s forced to choose between his immigrant Jewish heritage and his aspirations to become a fully secular Broadway star. A megahit of its time, The Jazz Singer is mostly remembered for its unfortunate use of blackface; and at a moment when problematic art is being necessarily reevaluated, we chose this film upon which to build a complex inquiry into the performance of American racial identity today. The respective cultural heritages of Gelb, a Jewish American, and Luckett, a Black American whose studies in Black and Jewish History complement his work in original composition, are the foundation upon which this particular investigation into appropriation, assimilation and atonement rests. (((jazz singer))) was chosen as our current project in an effort to engage in a hyper-local story about the Lower East Side. 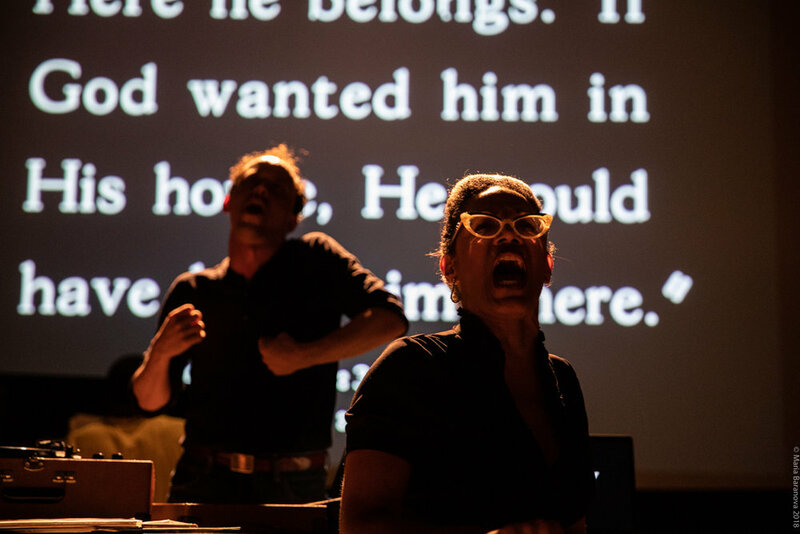 Commissioned by Abrons Arts Center, this new project will culminate in a 16 performance run in September/October 2019 on the historic Henry Street Settlement Playhouse stage, located in the Lower East Side mere blocks away from where the story of The Jazz Singer takes place. Our goal is to recreate in a contemporary setting the sound recording session that realized the first Hollywood talkie, re-imagining what the film would have been like if it included not merely the whitewashed standards of Irving Berlin, but a more authentic jazz sound from the likes of Louis Armstrong or later luminaries like Charles Mingus and Ornette Coleman. By exploring the origins of Jazz, we hope to pose questions about systemic racism, anti-semitism, and concepts of whiteness, using music as an entry point into an otherwise toxic cultural artifact. 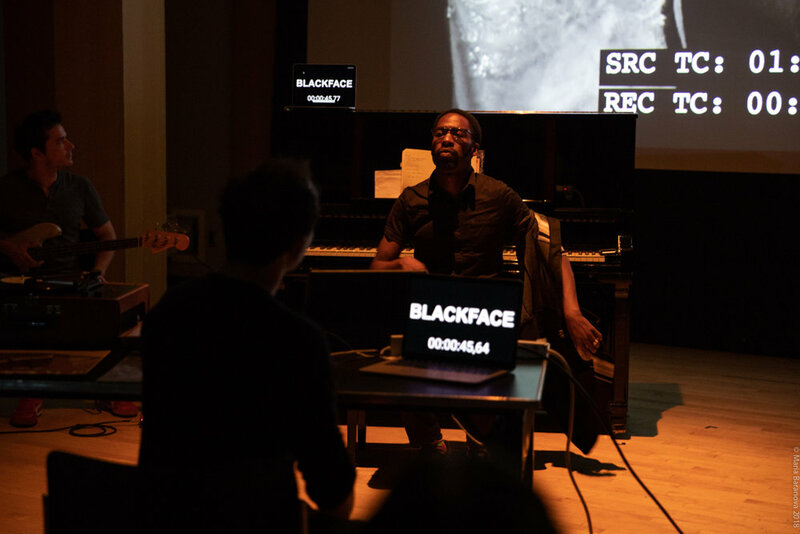 Highlighting a diverse collective of theater-makers, musicians, and designers, this piece aims to privilege artists of color as we subvert, interrogate, and reclaim what many consider to be a problematic pillar of the American cinema. While each artist has a specific role in the work, the resulting company is creating the work collectively, responding to the film and the corresponding research through a series of improvisations and provocations, much the same way as a jazz musicians might respond to an old standard. (((jazz singer))) was created in residence at Abrons Arts Center, with developmental showings at Little Theater (feat. Joshua William Gelb, Nehemiah Luckett, and Moe Yousuf) and Prelude 2018 (feat. Gelb, Luckett, Tracey Conyer Lee, and Nathan Stevens).